Last year I presented how Query Optimizer works in Kitchner developer group. Found myself coming back to slide multiple times, so thought its good idea to post all information in this post. You would like to go through this useful cheat sheet for “Query and Search” optimization, few of this is discussed in this post as FAQ. 171 : How Standard Fields and Custom Fields related information is saved inside Salesforce Database? 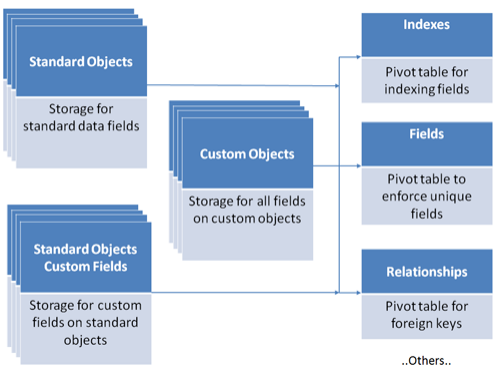 Is every Standard and Custom Object is created as a different Database table? Salesforce is using Multi-tenant architecture, means many organizations (Tenants) are using same infrastructure. Salesforce Database saves Metadata Information in hundreds of table. Run time engine then generates organization specific query to get information about their organizations and Data from common table as shown in below diagram. Below Database tables are partitioned by Organization ID and generates virtual table specific to Org. 172 : As a Developer, how can you optimize SQL query to fetch data from Salesforce Database? As Salesforce doesn’t save data in traditional way. Data of all tenants are in common table, so traditional Query optimization query and technique will not work in this case, so there is no such tool available to optimize final generated SQL. We only have option to create SOQL which is optimized by custom inbuilt Force.com Query Optimizer. In Summer14, Salesforce released Query Plan Tool to analyze how query is performing. With help of this tool, we can get an idea how we can change our query to perform better. 173 : When records are created in Salesforce, How it is queued for Indexing?